Woo man... This morning's assessment was Ruff! 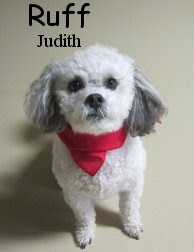 Ruff is a four year old, seventeen pound, exceptionally cute, Bichon Frise / Miniature Poodle Mix. What a nice guy Ruff is, he spent time upstairs in the Little Roll and did good. He sniffed around a bit and even played some. It was actually quite a "smooth sailing" ;) assessment. We think that Ruff enjoyed his stay, he is welcome back anytime, hopefully he returns soon. Happy Monday, welcome back sun!